Sasha’s Interview in Russian and How She Found Her Birth Mom – and Extended Family! After the Interview: I Found My Birth Mom – and Extended Family! Yes, dear friends, it is true! Only a few hours after I did the interview with Maria on Saturday, she was able to find my birth mom by searching social media. I only found out the news on Sunday afternoon, when Maria told me she had some “updates” and wanted to share them with me. Little did I know, she had been talking to my mom, learning the story of my adoption from the side of my biological family! I was shocked, but it was soon apparent, it was true! My adoptive parents and I were all so happy to hear this amazing news! My parents, Brian and Stephanie, have always been very open about my adoption. To be able to talk to my birth mom and tell her we have prayed for her all these years: “I love you, I have a good life. Thank you for giving me life. I don’t have questions I need answered. I don’t blame you – I don’t even see anything to forgive,” is an opportunity no words describe. Getting to video call her, and meet my mom, her husband (Papa) and my sister was such a beautiful experience. Not only have I met my mom and her family, I am meeting aunts, cousins, grandparents, uncles and more! It is an incredible blessing to see and now be a part of such a strong, welcoming family unit. Not every adoption story ends this way and I am overwhelmed with gratefulness, that the Lord has written my story this way. In sharing this news, I know so many friends and families will be excited. I pray this story is also an encouragement to other adoptive families and children. I hope you will join me in giving the glory to God – “Let them know that it is Your hand— that You, Adonai, have done it.” (Psalm 109: 27). That: “A father of orphans, defender of widows, is God in His holy dwelling. God settles the lonely in a home” (Psalm 68:6-7). Sasha Speaks on Special-Needs: "I Didn’t Start Out Normal to Begin With"
Thanks to some great friends, I got the opportunity to see Priceless, the film that was popular last year. It is the story of a man named James who unintentionally gets involved in the lives of two sisters, Antonia and Maria, who are being trafficked across the country. When he realizes what is happening, part of him wants to ignore his part in the atrocity. But a voice keeps calling him back until he can no longer ignore what he must do. James, along with the help of his newfound partner, Dale, an older man hiding a past of his own, set out on a harrowing mission to free the sisters and shut down the trafficking and prostitution in the area. While some plot points of the movie are dramatized for the sake of film, it is based on true events and stories of human trafficking survivors – and this knowledge adds all the more depth to the characters’ plight. There was one part of one conversation that stood out to me in the movie. Dale tells James about what he will encounter if he chooses to rescue the girls. This. This is the reality of special-needs adoption. Any adoption is a compassionate commitment to a child. Yet, I think nothing changes a person as much as special-needs adoption, both when travelling to bring the child home and later, when the trips are done, the rescue mission complete, and you settle into a new everyday routine. I traveled to Ukraine in 2014 amidst the EuroMaidan protests to bring home two of my sisters from a дом инвалидов (literally translated: Home of the Invalids, ie. special-needs orphanage). Looking back, Dale’s words to James could have easily been said to me, both then and even now. Sasha, if you go to this orphanage, it’s all in. When you step in those doors, you will always carry part of it with you. You will dream it, write about it, talk about it – until all your friends are sick of it. But you will keep screaming for those who cannot, even when it seems like no one listens and you are so tired. Still, you will carry it with you and keep on. You go down this road, lined with dying children, lonely souls who have never been touched….the road of advocacy, with hundreds of pictures of children whom you will never meet, but who grab your heart. You will weep over some and wonder what it is that has pricked you heart so deeply for those you never met. Weighing 12 pounds at 5 and a half years old. the things you’ll do… I remember holding hand of a seventeen year old with a shaven head. I stroked the top of his hand, but even this gentle movement did not bring comfort to him. Instead, his eyes clouded and his face winced in pain. Or, how I was approached by translator when we came into the room. I heard one voice chattering in a room full of forty children and found out what the boy was saying through our translator. “Sasha, he says he wants the pretty girl to come sit next to him.” So I sat and smiled and kept the company of a boy who was my age, with pale skin, a gaunt face, and bristly short hair trapped underneath a mound of comforters. At that time, he could still talk and smile and his laughter brought smiles to everyone else. The reality is, when you embark on a journey of special-needs adoption – you can’t go back to normal life again. It’ll change you, whether you are prepared or not, whether you think it will or not. And most likely, even if you are prepared, it will change you in ways you never planned. What is normal life anyway? Do you mean that other families have parents who have weekly date nights? Or have annual vacations? I often find myself forgetting that most other families don’t get a row of children in diapers ready for the day or down for bed every day. Or that I’m the only family I know with six daughters who can’t walk independently, some who will need lifelong care. It’s not normal, I suppose, to have to help almost all your sisters eat all their meals, because their special-needs make it hard or impossible for them to do so themselves. The time spent in doctor’s appointments and wheelchair fittings is more than usual. And it most certainly is changing me. Yes – it is a process, every day. I don’t think I will ever reach the point of saying I am done being changed by what I’ve seen or my sisters’ lives. I recall different moments from my trips at different times, some memories more emotional, more stirring than others. I can close my eyes and picture myself back in the дом инвалидов and the weight of the experience still makes me cry, four years later. And each day, my sisters teach me about selflessness, patience, and compassionate understanding in a deeper way than I could ever learn on a missions trip. I watch more Peppa Pig and Paddington than most of my peers and have learned to do my work amid constant interruptions. I am teaching English to my teenage sister and sign language to another. All while being a honors student at Bucknell University, double majoring and looking into graduate programs. And, after all, isn’t a child’s life worth much more than the cost a fancy vacation which will come to an end? No, my life as an adopted sister is definitely not normal – it’s so much more exciting than that! Adopted from a Russian mental institution at 17 months old because of my mild Cerebral palsy, I, like James, have had my own journey. So, you see, I didn’t start at normal to begin with. It is amazing to see how the Lord is weaving my story together with those of my sisters and how my own adoption and disability has prepared me for their needs. Some may look down this road and decide, as James could’ve, it’s not for me. I wouldn’t blame them. As Dale says, you gotta do what you gotta do. Family is important. But, he also says, if you are hearing a small voice inside of you saying, don’t forget – listen to that Voice. The road of special-needs adoption is long. It’s filled with equal measures of joyful blessings and painful lessons. But any heartache is overshadowed every time you think of the rescue – once seemingly impossible, now complete. A life given a new chance. This is the priceless reality of leaving normal behind. Lina this Christmas, home for over 5 years. 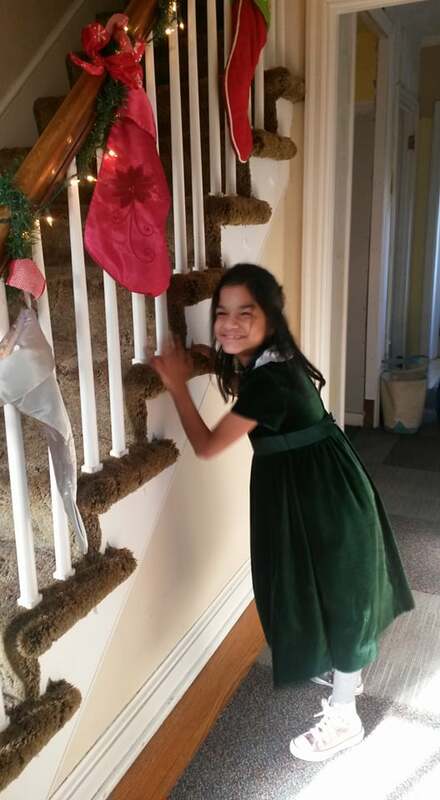 This precious girl, who is described as “merry and radiant,” will be transferred to an adult mental institution. Many of you may be following the story of Allie-Jo, a 13 year old in China who is aging out in 3 weeks. Did you know that S is also aging out in 3 weeks? Please help S the same way you are helping Allie-Jo. Pray and share her story! As an adopted woman with six adopted, special-needs sisters (including from Eastern Europe) I know what a bleak future awaits S if she is not adopted. A family would only have to complete their I800A before her birthday to keep her from aging out! If you are considering S please know that Ting Ministries will do whatever we can to help! Please don’t let finances or medical terms deter you. This is not a game. Advocating is not something we do just for fun. A child’s life is at stake. PLEASE– we have videos of S talking, pictures, and more information about S on our Waiting Child Advocacy page at www.tingministries.blogspot.com. Please contact us for the password so you can learn more about S today. There is no time to waste. A bit about S: She is a girly-girl who loves to do her nails, and wear bows and tiaras in her hair. She is listed as having moderate mental delay, hydrocephalus and Spina bifida, but she can get around independently in her wheelchair. S is quite social, a leader among her peers, and loves going to school (for special-needs children). Orphans don’t need curious bystanders. Orphans need incurable fanatics.